Here are simple directions for how to make kefir. Because I'm veggie, these recipes are with nut milks, coconut water, and quinoa milk. If you don't care for kefir alone, I'll give you some ways to use kefir other than just kefir smoothies. Here are directions to make kefir, and recipes for a simple kefir cheese and for kefir ice cream. 1. Obtain about 4 tablespoons of kefir grains You can use either the conventional kefir grains or water kefir grains. Place them in a clean glass jar. 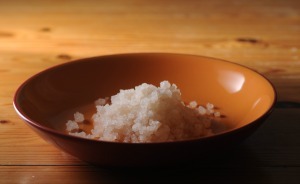 Kefir grains can be obtained from other kefir enthusiasts. (See sources below). 2. Pour about 2 cups of nut milk, coconut water, or quinoa milk over the kefir grains. You can use any type of nut milk. 3. Cover the jar either tightly or loosely. If you use an air-tight lid you will get a “fizzy” kefir. Using a paper towel or a clean coffee filter, fasten the towel/filter to the jar with a rubber band. This will give you a “non-fizzy” kefir. Let the grains and milk sit at room temperature for about 24 hours. 4. After 24 hours you will have kefir. Pour the finished kefir through a strainer and into a bowl to catch the kefir and separate the grains from the kefir. Stir with a plastic spoon or flexible (non-metallic) spatula until all the kefir goes into the bowl. Do not rinse the grains or press the grains. The grains will have some kefir coating them, but this is okay. 5. Spoon the kefir grains from the sieve into another clean glass jar for your next batch. 6. Taste your kefir. It should be thick with a sour taste and a hint of yeast. If it is too sour, add more milk to the kefir grains for the next batch. 7. Refrigerate the strained kefir in a glass container and enjoy. Kefir grains cannot be made. You can only get kefir grains from someone who has been making kefir. For free kefir grains, you usually have to pay the cost of shipping. Check out the Yahoo talk group Good Kefir Grains. For worldwide sources of free kefir grains, and those you have to pay a small fee for a starter. Here is Real Kefir Grains. - You can buy a kefir starter, however, my advice is don't. The quality of kefir using the grains is far superior. - You can use any type of nut milk to make kefir. Try using soy milk, almond milk, coconut milk, rice milk etc. 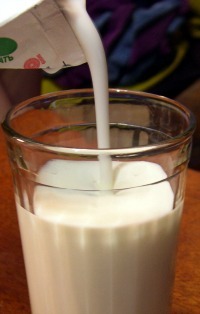 However, the kefir grains can be harder to grow because nut milks are lower in sugar. You can help this along by adding 1 tsp of sugar to a liter of the nut milk for your starter, or you can experiment with raw honey or other natural sweeteners. - You will have kefir when you cannot swirl the milk in the jar. This means it is thick enough to strain. - Store your kefir in a glass container; avoiding stainless steel. Kefir reacts negatively with stainless steel and cause a chemical reaction after prolonged contact. That is why I also suggest using plastic strainer and plastic spoon or flexible(non-metallic) spatula to work with the kefir. - Finished kefir usually has the consistency of pudding. It is thick with a sour taste. Remove the grains and cover the jar tightly. Let the kefir continue to ferment for another 12 to 36 hours without the grains. Even without the grains the fermenting process will continue and the kefir will become sour, but not yeasty. Leave some head space in the jar for the milk to expand while it is fermenting. - The consistency and taste of the finished kefir depends on the temperature of your home and the amount of grains to milk ratio that you are using. The warmer your home and the more grains, the faster you will get kefir. - If you are using nut milks, there will be very little, if any growth. As your kefir grains grow, either use more milk or remove some of the grains. You can eat the grains or add them to smoothies for even greater probiotic benefits. This will help to protect you, especially during cold or flu season. You can also give them away to your friends so they can make their own kefir. Giving away grains will help you have a backup source of grains if something were to happen to your kefir grains. - Kefir made with coconut water will have a less sour taste. You will need to add a sugar to it for the grains to grow. You can experiment with natural sugars. 1 teaspoon sugar to 1 liter coconut water is a good rule of thumb. It takes 12-36 hours to ferment. Children love this effervescent probiotic drink! You can use this as a basis for smoothies or for a wonderful ice cream. - Kefir can be made with the highly nutritious quinoa. Take 2 cups raw quinoa and place in large bowl with 1 quart water. Soak overnight with a sprinkle of sea salt. Rinse quinoa and put in blender. Blend for thirty seconds. Put in nut milk bag and strain. Pour liquid in sterile glass jar. Add kefir starter and sit at 78-80 degrees for 24 hours. Drink as is or add sweetener such as stevia or vanilla. - You can store kefir grains in the refrigerator with a container with fresh water and sugar for about two weeks. Kefir grains use the sugar as food, so make sure they are being fed. When you want to start using your grains realize that the cold temperature will have put them off balance. Just follow the basic instructions for how to make kefir, and in about 3 days they will be making kefir beverage again. Your choice of flavorings or extracts such as raw cocoa, raw carob, fresh fruits, or a banana (the banana will give a thicker consistency to the ice cream. Place nut milk into your storage container. Add the 1 cup of milk kefir. Using the wire whisk, mix these liquid ingredients together well. Cover and allow to sit in the fridge for the next 24 hours. OR add whatever flavorings you desire. You can get creative here, just add your favorites! Whisk the mixture 2-3 times during the 24 hours 'sitting time' to get the sugar to dissolve well. This will also allow the keifr to 'do its thing ' with the milk and sugar. After 24 hours transfer the milk mixture into your ice maker and follow their recommendations for fill level and churning time.